Quebec falls at the juncture of the interests of three nations: France, Britain and the United States. The French of course were the first ones there (if one doesn't count the Indians, and really, who historically has), and started building protective walls around Quebec City in the 17th century. A master plan for the city's fortification was approved by Vauban in 1701, and there was a great enthusiasm for construction when British colonists captured Fort Louisburg in Nova Scotia in 1745. Part of what the French built in 1745 was incorporated when the current structure was built from 1820 to 1831 by the British. The intent was to secure Quebec City from the continually marauding Americans, but the fort was also to act as a refuge for the British garrison should the locals get frisky. Three smaller, supporting forts were built between 1865 and 1871 across the river from the Citadelle, as a result of fears of American invasion stemming from the US Civil War (1861-1865). The British military left Quebec in 1871, but the excruciatingly Britishly-named Frederick Hamilton-Temple-Blackwood (1826-1902), Governor General of Canada from 1872 to 1878, established the Citadelle as an official vice-regal residence, which helped to ensure the preservation of the fort. In 1943 and 1944, Canadian Prime Minister William Lyon Mackenzie King (1874-1950), US President Franklin Roosevelt (1882-1945) and British Prime Minister Winston Churchill (1874-1965) met at the Citadelle to discuss strategy for the ongoing Second World War (1939-1945). 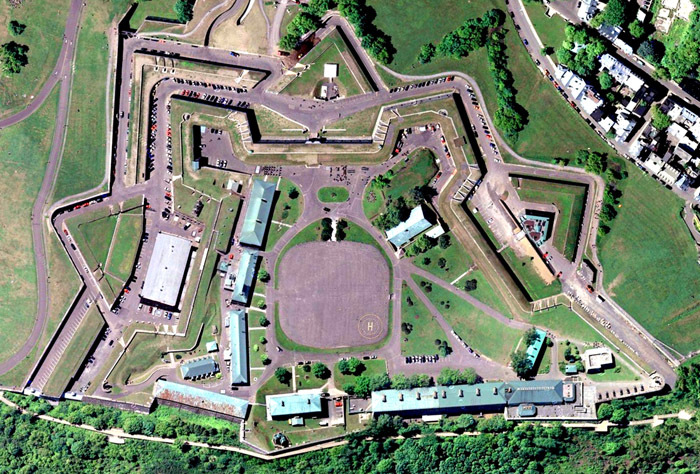 The Citadelle is still an active military garrison, home to the Canadian Royal 22nd Regiment. Public tours are conducted on a regular basis, however: The Changing of the Guard is a popular and colorful ceremony (the Regiment wears the scarlet coat and vast bearskin headgear of the classic Beefeater for these events), at which, if one were to be particularly fortunate, one might catch a glimpse of the regimental goat, Batisse. Please head to my Contact Page or Guestbook and let me know. My methods for gleaning information regarding these forts is pretty haphazard, so I truly appreciate any input I can get from people who actually know stuff! Thanks to Google Maps for the image!